I just visited the SLAS2012 conference and reconnected with some great reps from life science media companies. They reminded me that sometimes there is such a thing as a free lunch, in the form of items you can have published for free to promote your company. Here is the list of our top five freebies for life science marketers, or for anyone who is looking to get exposure. Application notes. Short articles showing your products being used in experiments are a great way to show scientists their real life application. They can be produced quickly and can help with search engine optimization (SEO) on your site. Also, Nature Methods allows you to upload application notes for free! You can also promote them reasonably (see the Nature Sales reps page for more details). Product launches. Several publications have a space where they list new products for free, check on their website or print version. Genetic Engineering News (GEN) has a nice new product section, see their editorial guidelines (PDF) for the details. Of course, be sure to include an image, it helps with visibility, and we’ve also found it makes a difference in life scientist purchase decisions. Press releases. Almost every media rep I talked to indicated that we should send them our press releases for them to forward to their editors. Although the release itself might not be free, several publications will also promote them online for free, often automatically if you use a service like BusinessWire or PR Newswire. You can also upload yours to BioSpace for free and they’ll create a free company profile for you. If your press release includes a personnel change, collect head shots of the employees, write a blurb for each, and submit it to publications like GEN and Chemical & Engineering News (C&EN) too. Posters. Scientific posters at conferences have always been the ‘marketer’s little secret’ for getting mileage out of a conference with a small budget. Did you know, though, that you can publish your posters online as well? BioTechniques publishes posters digitally for free, and there are also other ways of publishing them online that are cropping up. Remember to post them on your website as well for your customers’ reference and added SEO. Great content. It was clear from talking to the media that they were VERY interested in those who can write articles for them. GEN has long featured ‘Tutorials’ which are usually articles written by industry folks who put a plug in about their products. The media reps almost universally perked up their ears when blogs were mentioned, as bloggers are not only a source of content, but may have a following which might benefit the publications. In these times of media volatility, great content is appreciated more than ever. Consider the experts you have at your company and reviews they could write that are related to your products, even those that may not feature them explicitly. Exposure for your company through a byline of a well written article is arguably more valuable than a full page print advertisement. Thanks to George Lui of Nature, Tamlyn Oliver of GEN, and James Secretario of BioTechniques for getting me up to speed on what life science media has to offer us. The best relationships are a give and take however, I hope this post will give their publications some exposure and we hope to be able to spend some money with them this year. 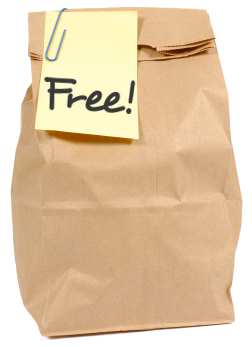 What are your favorite freebies for life science marketing?